A wonderful addition to the newer generation of London’s stylish Japanese restaurants is Kobe Jones. This restaurant uniquely blends east - west flavours and styles aiming to provide fresh and exciting food, in a stylish yet informal setting, something they have succeeded to do with elegance. 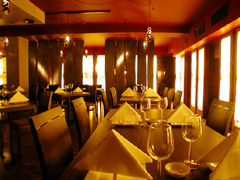 The restaurant is spacious and comfortable with excellent service and a mouth-watering menu. There’s something romantic and exciting about Kobe Jones. Decorated in neutrally coloured modern sleekness there’s lots of sultry dark wood and gold complimented by soft lighting. There are a series of small rooms surrounding the main dining area and large booths, which provided instant intimacy for those looking for a private evening. Kobe Jones has outlets in Sydney, Melbourne and Bangkok. There�s a beautiful cocktail bar, which exudes a fresh loungey feeling and is perfect for pre-post dinner drinks with a good wine list and an amazing array of creative cocktails to suit every taste and mood. Staff are polite, friendly and professional. Kobe Jones can be hired exclusively for a party or corporate event. There are 3 separate private rooms perfect for business lunches and family get to-gethers. Whether it�s a birthday party, hen-night or product launch the flexibility and authenticity of the Kobe Jones makes it one of the best venues to entertain clients or celebrate with family and friends. Inspired by the best of Eastern spices and the Californian flavours of the west. The huge menu is fresh and light containing some surprising delicious dishes. The staff are friendly and enthusiastic, and more than happy to explain the 'different' aspects of the menu. You will find excellent renditions of Japanese favourites as well as a few new one�s for the more adventurous customer.